Sydney Shop Girl: The Weeknight Book Club: Something Blue by Emily Giffin. The Weeknight Book Club: Something Blue by Emily Giffin. 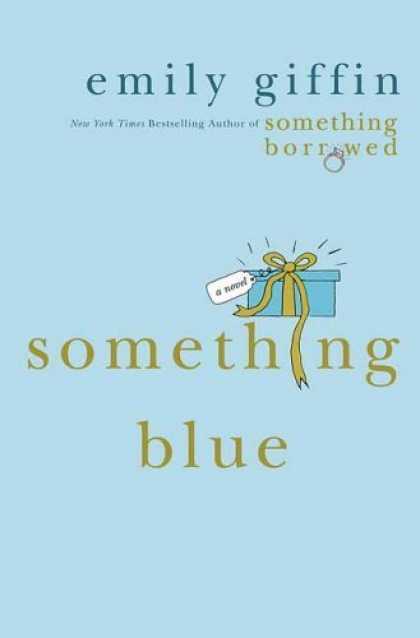 'Something Blue' is the follow up novel to 'Something Borrowed' (link is to my review from earlier this month) and takes up the story in the aftermath of The Shocking News and The Even More Shocking News. The Shocking News - Darcy was cheating on Dex with his best friend Marcus and that she was pregnant with Marcus' child. The Even More Shocking News - that Rachel and Dex are very much an item. The novel unfolds from the point of view of Darcy and at times this was an extremely annoying narrative device. I found Darcy to be unbelievably superficial and self obsessed at times. The only thought that kept me going was the chance to find out what happens with Rachel and Dex. Central to the plot of 'Something Blue' is that Darcy as the pretty girl with the charmed life and not so charming character gets her comeuppance. The subplot is that she also learns to become a better person and friend. Fortunately, Darcy does become less annoying with each life lesson she learns. The rebound relationship with Marcus fails and with this Darcy learns that not everyone will bow down at her feet and do as she commands. As her body changes with pregnancy, Darcy is no longer the hot commodity on the New York City social circuit she once was and her fair weather friends quickly pick up the scent of change around her and act accordingly. Her glittering life now badly tarnished, Darcy finds herself returning to the unconditional friendship of her high school friends from Indiana. Too ashamed to go home to live with her parents, Darcy takes up Annalise's idea of moving to London to stay with their mutual friend (and one of Darcy's conquests) Ethan. Ethan, who is probably a better person than I would be in the circumstances, agrees and Darcy comes over to take over his cramped flat with her bags of designer gear. Life for Darcy in London is a major culture shock. She doesn't meet her titled and wealthy Prince Charming within minutes of landing and she finds that her lack of formal qualifications makes finding a job impossible. Eventually, impending motherhood snaps some sense into Darcy. She is forced to think about someone other than herself and she makes necessary changes to her life. She does finally find love, a dashing wealthy Londoner and what is really important in life. But it's not how you might expect it to happen and yes, Rachel and Dex do appear in the later chapters of the novel. I did enjoy 'Something Blue'. It wasn't as racy as 'Something Borrowed', a more mellow read, I'd say. I know I said Darcy irritates the heck out of me but to be moved to such an extent about a character in a chick lit novel is testament to Emily Giffin's skill in this genre. I've read both of these. I couldn't agree more. Kinda love the ending. Kinda hated it too. Strange. But a good read for sure. I enjoyed the first more too.